Remove neck and giblets from turkey cavities; discard or reserve for another use. 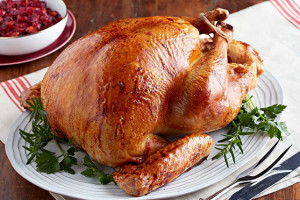 Place turkey in plastic brining bag or turkey-size oven bag. Bring 3 qt. water, salt, garlic, onions and herbs to boil in 8-qt. stockpot on high heat, stirring occasionally. Remove from heat. Add ice water and dressing; stir until ice is melted. Slowly pour over turkey in bag; tightly close bag. Refrigerate at least 8 hours or up to 16 hours. Remove turkey from bag; discard bag and brine. Pat turkey dry with paper towels. Let stand at room temperature 30 min. Heat oven to 425ºF. Place turkey on rack in roasting pan sprayed with cooking spray. Bake 20 min. Reduce oven temperature to 375ºF. Melt butter; brush onto turkey. Bake 1-1/2 to 2 hours or until turkey is done (165ºF). Transfer to cutting board; tent with foil. Let stand 15 min. before carving. This entry was posted in Main Dish on November 25, 2015 by lonny.